Full-coverage indigo-blue microglitter in a clear base. Light teal/aqua blue microglitter and small hex glitter mixed with larger silver holographic hex glitter and bar glitter. Large and small purple and magenta hex glitter in a clear base. Glitter is dense enough to be worn alone at three coats, but also makes a good glitter topcoat at one coat. 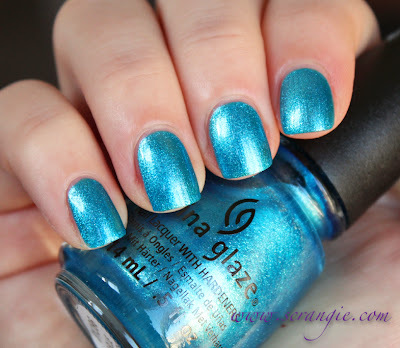 Cyan blue foil with sparkly silver flecks. Warm orangey-coral red foil with light gold shimmer. 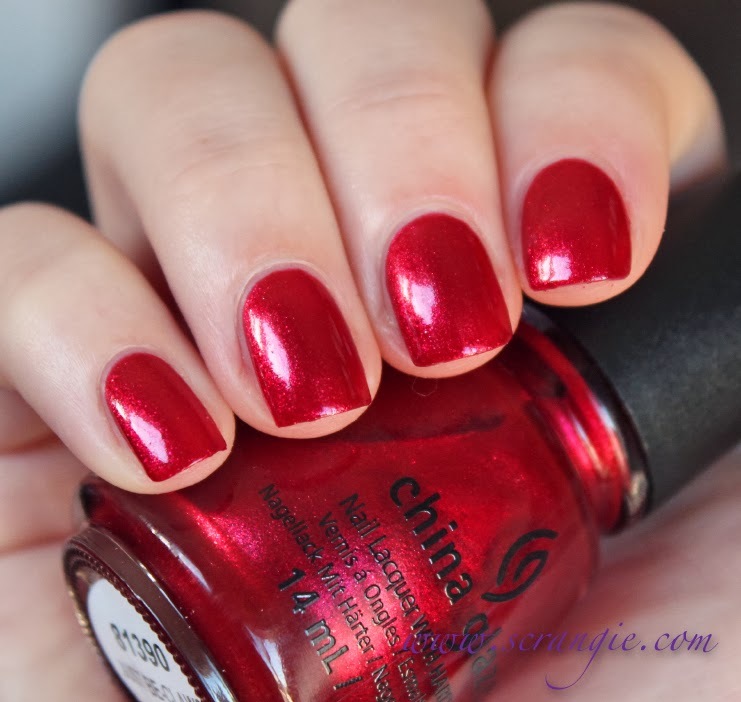 Rich poinsettia red foil with red sparkle. Warm gold foil with chunky yellow-gold foil flakes. 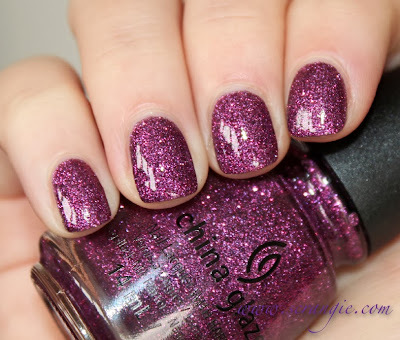 Full-coverage plum purple microglitter in a clear base. 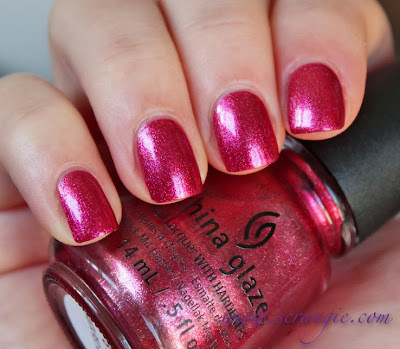 Cool dark pink foil with silver shimmer. 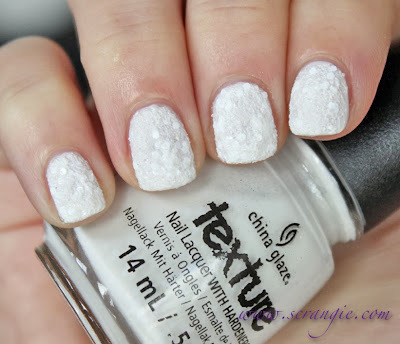 Girl, there are really no words strong enough to describe all my longing for snow-textured polish. I don't want my feelings restrained. Oh, babe, I just need you like never before. Just imagine you'd come through this door. You'd take all my sorrow away. There's Snow One Like You. SORRY. Sorry! This is a white semi-sheer creme base with large matte white hex glitter and a large amount of textured grit. Warm golden green microglitter, gold microglitter, and slightly larger (but still tiny) blue-green glitter in a clear base. Large matte white, cobalt blue, light purple, and light copper hex glitter with smaller copper, green, and white hex glitter, plus very small matte white glitter in a clear base. Good as a topcoat or worn alone with two coats. The formula on these was varied. 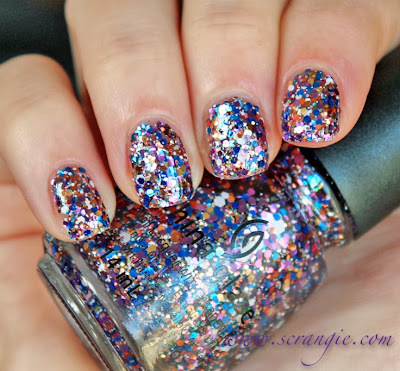 The tiny glitters and the foils were thin, smooth, and perfect. The larger, chunkier glitters and the textured shade were thick and somewhat gooey. 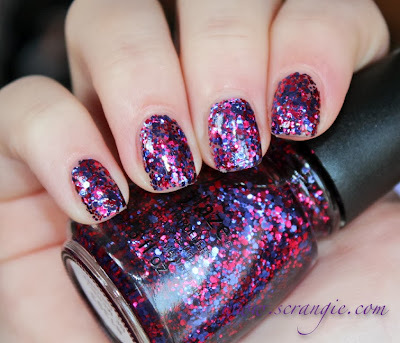 To apply the large glitters, I needed to dab the polish onto the nail to get even glitter distribution. Dry time on all shades was fast. It doesn't really feel 'holiday', does it? It doesn't to me, at least. It is heavy on the red like a typical holiday collection, but there's a lot of other non-traditional shades mixed in here as well. Your Present Required doesn't look like any other color I own, so that's pretty cool. The fine glitters are full coverage and extremely sparkly, which I also appreciate. The foils are shiny and reflective like foils should be, but the colors themselves aren't particularly interesting or new. The one problem I have with this collection is the textured polish, There's Snow One Like You. It looks promising, but it's so incredibly thick and lumpy that I had a very hard time applying it. It's like there's too much texture. It applies clumpy and all the glitter and grit stick out at weird angles because it's so dense. Maybe that's the point, though? To look like freshly fallen snow, while it's still fluffy. 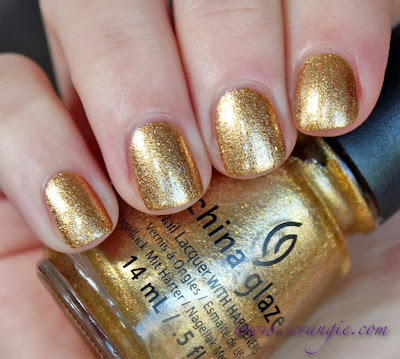 The China Glaze Happy HoliGlaze Collection is available now! They all look wonderful on you! 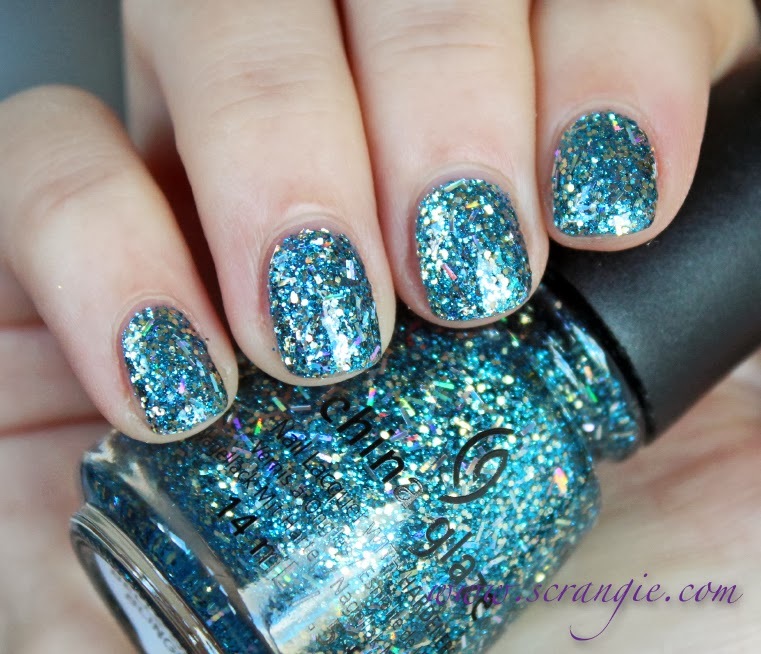 While it definitely doesn't feel very "holiday" some of these polishes are just out of this world! I've GOT to get my hands on Your Present Required! And you're probably the only person who can make There's Snow One Like You look even remotely good. Nice to see you post again. :) I feel like your blog has been very quiet lately. I hope you're alright. I was honestly kind of bummed on this collection until I saw Put A Bow On It. Not necessarily holiday-like, but pretty. I'm torn if I like There's Snow One Like You. It's so odd, but maybe good odd? I'm conflicted, lol. That snow textured polish looks so cool. I have a feeling it would catch on everything though. OMG I *need* that snow textured one! I really like the glitters! The snow polish looks good on you! I have seen some horrible pictures of that one. Otherwise I like Bells will be Blinging, it looks like Atlantis with some extras.. I totally love all wrapped up and so blue without you, because I'm a huge blue-fan, and so I will get these. But on another matter, Scrangie - do you remember what you said about green holos? That those that existed were all those light minty springgreens? I got my "I love nailpolish"-order today and there was a saturated leaf-green, almost dark green holo in it. 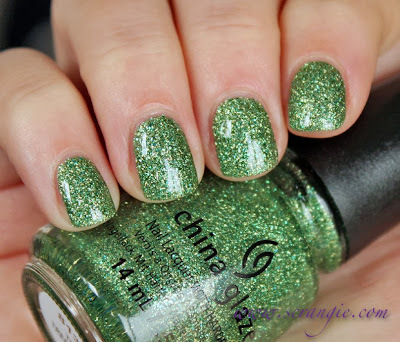 The dark green holo polish is called "A fresh evergreen". 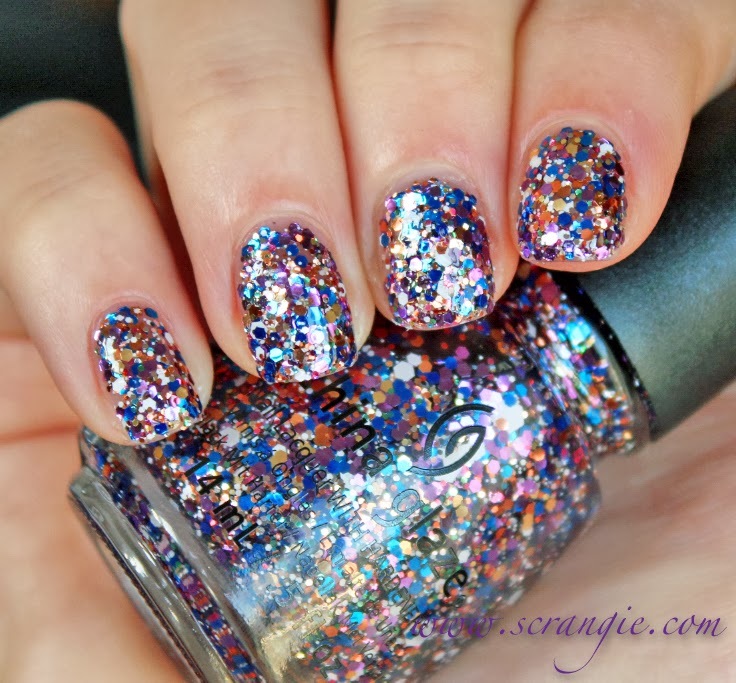 Did you have to use a lot of layers (more than 2 or 3) for those micro glitters, ie. All Wrapped Up and This Is Tree-Mendous? Nope! I was quite happy with how dense they were, they were completely opaque at three coats, *almost* *super close to* opaque at two. I love There`s no snow one like you! I`ve even shown it in my blog! Just used it upon white undie.